Design a window? There's an app for that. 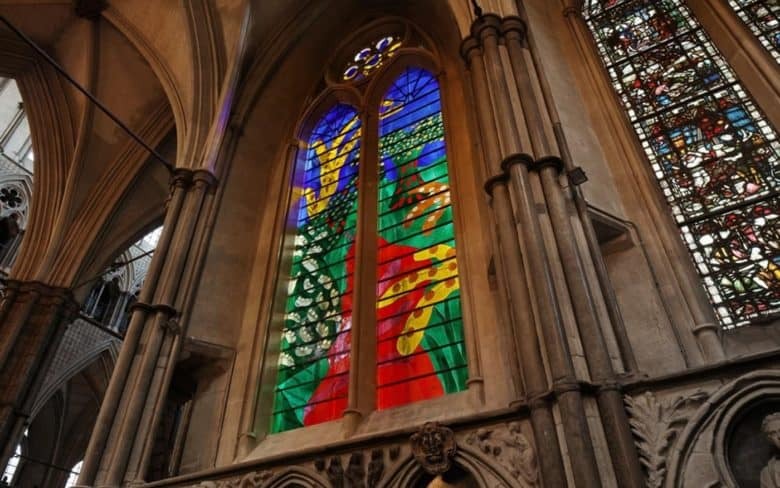 British artist David Hockney has unveiled a new stained glass window at London’s renowned Westminster Abbey, commissioned to celebrate the reign of The Queen. So far, so ordinary, you might think? Except that this window was designed by Hockney on his iPad, before being turned into a 28 x 11.5-foot window by a stained glass studio. The window, which is formerly referred to as The Queen’s Window, is in the Abbey’s north transept. Up until now, it was plain glass. This is David Hockney’s first work in stained glass, although he is no stranger to iPad art. Virtually since the iPad was first released in 2010, the now 81-year-old artist has frequently “painted” using Apple’s tablet. Dozens of these works have now been exhibited, and bought by collectors. Hockney said that the iPad was the “natural thing” to use for this specific design, since it is backlit like a window. The artist was reportedly tasked with creating a work that was, “symbolic or representational of the subject, rather than a heraldic or figurative design.” He was also asked that it be recognizable as his work. The reaction has been largely positive. “Just beautiful,” writes the Royal College of Art. There have, of course, been a few detractors, however. “It was done on an iPad? Yeah it looks like it mate,” writes one Twitter user, who tweets regularly about church architecture. What do you think of the design? Let us know in the comments below.